The UN: failing the Rohingyas? “The government knows how to use us and to manipulate us and they keep on doing it – we never learn. And we can never stand up to them because we can’t upset the government.” The parallels between the UN’s performance in Myanmar and Sri Lanka (not to mention Syria) have struck me for some time. This damming BBC report simply made them more explicit. The UN in Myanmar “strongly disagreed” with the BBC findings. For UN staff it meant that publicly talking about the Rohingya became almost taboo. Many UN press releases about Rakhine avoided using the word completely. The Burmese government does not even use the word Rohingya or recognise them as a distinct group, preferring to call them “Bengalis”. During my years reporting from Myanmar, very few UN staff were willing to speak frankly on the record about the Rohingya. Now an investigation into the internal workings of the UN in Myanmar has revealed that even behind closed doors the Rohingyas’ problems were put to one side. 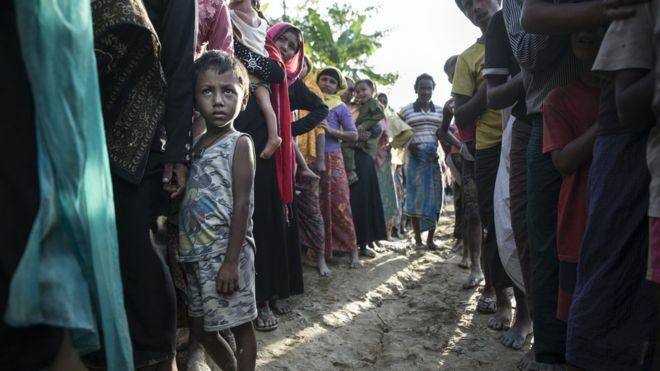 Multiple sources in Myanmar’s aid community have told the BBC that at high-level UN meetings in Myanmar any question of asking the Burmese authorities to respect the Rohingyas’ human rights became almost impossible. Ms Vandenabeele said it soon became clear to everyone that raising the Rohingyas’ problems, or warning of ethnic cleansing in senior UN meetings, was simply not acceptable. Repeat offenders, like the head of the UN’s Office for the Co-ordination for Humanitarian Assistance (UNOCHA) were deliberately excluded from discussions. “I received this advice from her – saying you should not go to northern Rakhine state – please don’t go there. So I asked why and there was not an answer in any respect, there was just the stance of not trying to bring trouble with the authorities, basically,” he said. Mr Quintana still went to northern Rakhine but said Ms Dessallien “disassociated” herself from his mission and he didn’t see her again. One senior UN staffer told me: “We’ve been pandering to the Rakhine community at the expense of the Rohingya. The UN’s priorities in Rakhine were examined in a report commissioned by the UN in 2015 entitled “Slippery Slope: Helping Victims or Supporting Systems of Abuse”. Titled “Repositioning the UN” the two-page document was damning in its assessment, calling the UN in Myanmar “glaringly dysfunctional”. In the weeks that followed the memo, the UN confirmed that Ms Dessallien was being “rotated” but stressed it was nothing to do with her performance. Three months on Ms Dessallien is still the UN’s top official there after the Burmese government rejected her proposed successor. The UN in Myanmar said its approach was to be “fully inclusive” and ensure the participation of all relevant experts. “We strongly disagree with the accusations that the resident co-ordinator ‘prevented’ internal discussions. The resident co-ordinator regularly convenes all UN agencies in Myanmar to discuss how to support peace and security, human rights, development and humanitarian assistance in Rakhine state,” a statement from a UN spokesperson in Yangon said. On Tomas Quintana’s visits to Rakhine, the spokesperson said Ms Dessallien had “provided full support” in terms of personnel, logistics and security. There are those who see similarities between the UN’s much-criticised role in Sri Lanka and what has happened in Myanmar. Charles Petrie wrote a damning report into the UN and Sri Lanka, and also served as the UN’s top official in Myanmar (before being expelled in 2007). He said the UN’s response to the Rohingya over the past few years had been confused and that Ms Dessallien hadn’t been given the mandate to bring all of the key areas together. So might a different approach from the UN and the international community have averted the humanitarian disaster we are seeing now? It’s hard to see how it might have deterred the Burmese army’s massive response following the 25 August Rohingya militant attack. One source said the UN now appeared to be preparing itself for an inquiry into its response to Rakhine, and this could be similar to the inquiry that came after the controversial end to Sri Lanka’s civil war – and which found it wanting.